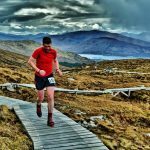 Join the Aonach Mor Uphill Race (April) which uses the Nevis Range Downhill Black Mountain Bike Route (The Top Chief) for an Uphill Running Race! For event updates see Facebook events here. We also have another uphill race; join our Glencoe Mountain Uphill Running Race in June – see here.